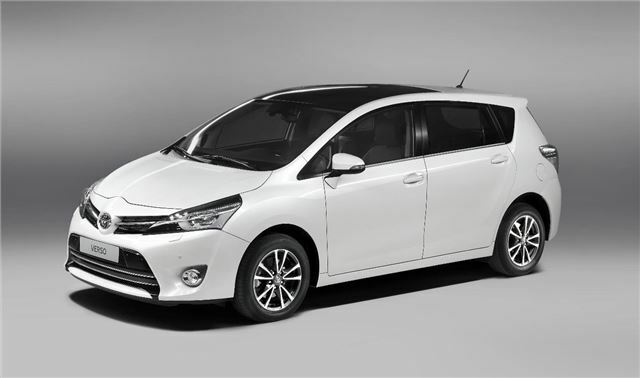 Toyota has premiered its revised Verso at the Paris Motor Show. The new model has been restyled to look more like other new Toyota models and benefits from improved materials and a revised interior, plus new trim details. Toyota says 300 parts have been changed as part of the upgrade. The majority of the obvious changes are at the front, where the styling has been improved to fit Toyota’s new design, with an appearance similar to the new Auris. The styling is designed to make the car look wider and less tall. Alterations include a new bumper, slimmer headlights and a new grille. The cabin features new colours and more tactile materials. Higher spec models benefit from Nappa leather around the door trims, armrest and steering wheel. There is also ‘satin chrome’ detailing and the attention to detail extends as far as the door handles, which get a new two-layer paint finish. The flexible interior remains, with plenty of storage areas and cubby holes, as well as a useful seating arrangement. It features three individual seats in the second row and two in the third. Upholstery for these has been revised with new colours and materials on offer. Engines have been improved with 10g/km lower emissions for the 2.0-litre diesel D-4D. A 2.2-litre diesel is offered too with either a manual or automatic gearbox. All of the diesel engines have a 200kg towing capacity than previously. Petrol engines are 1.6-litre and 1.8-litre valvematics, with the 1.8 available with a CVT automatic gearbox. Finally, body rigidity has been increased to provide a more control through bends, while the suspension has been altered to increase ride comfort. The steering has been tweaked for better weight and feel, while the sound-proofing has been improved to make for a more refined drive. The revised Verso will be available shortly, but UK specific pricing and spec details are to be confirmed.